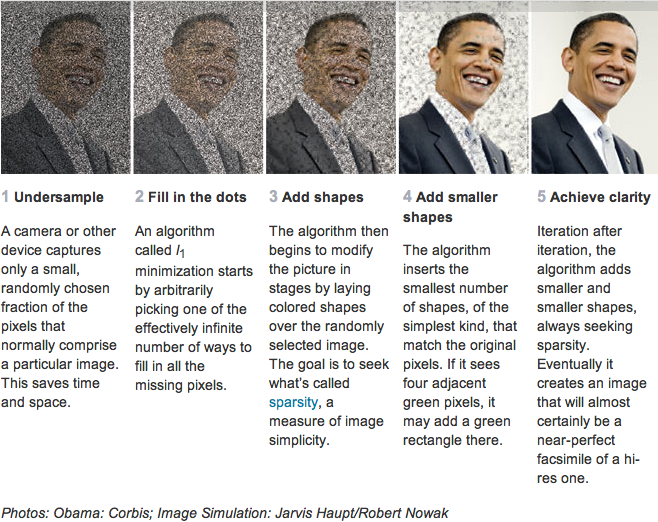 Wired has a nice lay-person write-up of the rapidly developing field of compressed sensing. This is a technique that allows accurate reconstructions of highly undersampled sparse datasets. This field really took off in 2004 when Emmanuel J. Candès discovered that a tomography phantom image could be reconstructed exactly even with data deemed insufficient by the Nyquist-Shannon criterion. It is probably the hottest topic in imaging theory today. Modified Shepp-Logan phantom with enhanced contrast for visual perception. Incoherence of Undersampling Artifacts: The aliasing artifacts in a linear reconstruction caused by k-space undersampling must be incoherent (noise-like) in the sparsifying transform domain. Nonlinear Reconstruction: The image must be reconstructed by a non-linear method which enforces both sparsity of the image representation and consistency of the reconstruction with the acquired samples. These conditions are well met by MRI imaging. This decoding technique dramatically shortens the required sampling times in an MRI magnet, which reduces the impact of motion artifacts, the bane of high-resolution MRI. Unfortunately, I don’t think it is very applicable to situations where signal/noise of the underlying source is poor, like counting action potentials in shot-noise limited in vivo calcium imaging. But it’s use is spreading into other related problems, such as mapping the functional connectivity of neural circuitry. 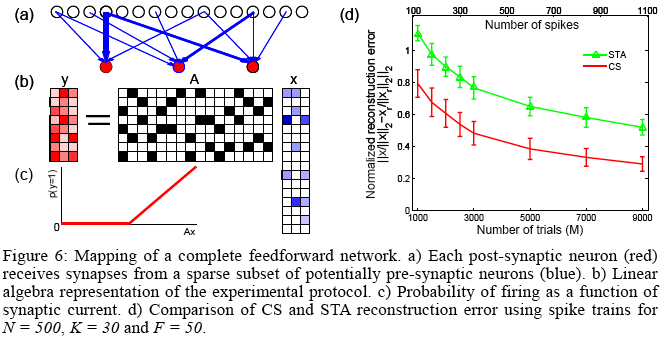 Tao Hu and Mitya Chklovvskii apply the compressed sensing algorithms in Reconstruction of Sparse Circuits Using Multi-neuronal Excitation (RESCUME) from the latest Advances in Neural Information Processing Systems journal. They measure a post-synaptic neuron’s voltage while stimulating sequentially random subsets of multiple potentially pre-synaptic neurons. The sparseness of connectivity allows them to map connectivity much faster than by a sequential method. UPDATE: If you want to get a better sense of the breadth and depth of the applications of compressed sensing, check out Igor Carron’s comprehensive site, Compressive Sensing : The Big Picture.